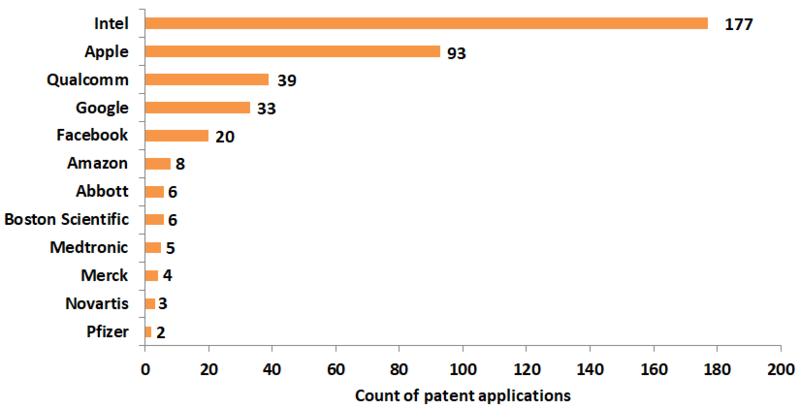 In this post, we take you through some of the recently filed patent applications of Intel, Apple, Qualcomm, Facebook, Google, Amazon, Medtronic, Pfizer, Boston Scientific, Novartis, Abbott, and Merck. 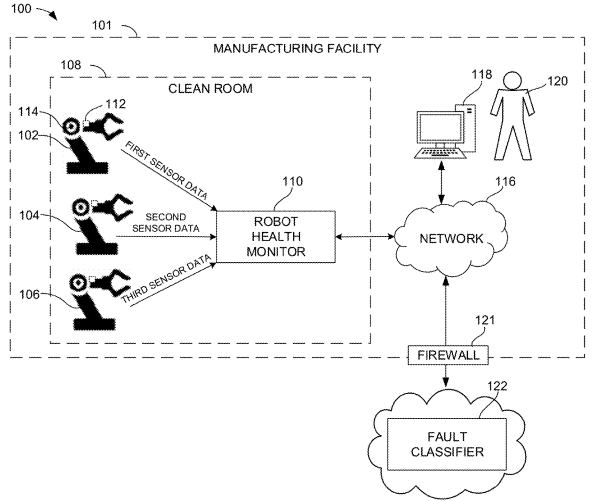 The robot health monitoring system disclosed in US patent application 20190099886 obtains vibration signals from a sensor coupled to a robot and transmits an alert if an extracted feature is above a quality threshold. Illustration below depicts the system. 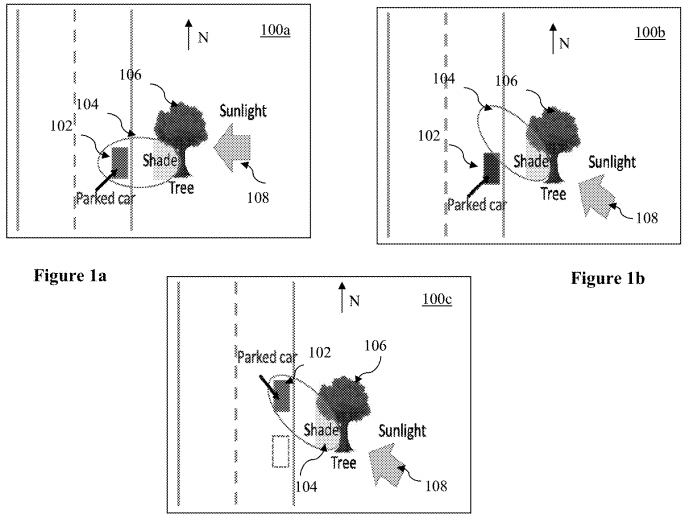 US patent application 20190101922 titled “Autonomous or Semi-Autonomous Parking Method and Apparatus” identifies a parking position for a vehicle based on environmental conditions received from sensor data. Figures below illustrate exemplary scenarios of the parking method. 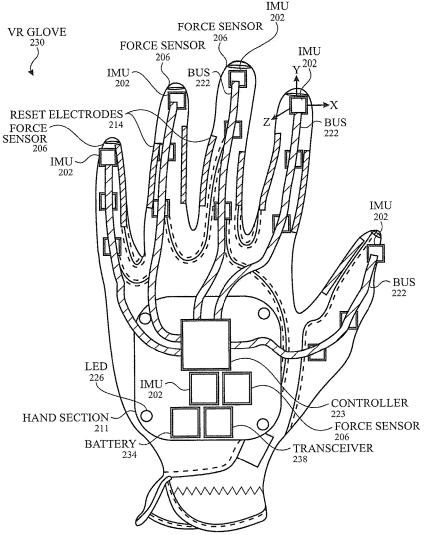 US patent application 20190101981 titled “IMU-based Glove” discloses VR gloves capable of measuring the position and movement of fingers and hands using IMUs and motion sensors. Illustration below captures the glove of the invention. 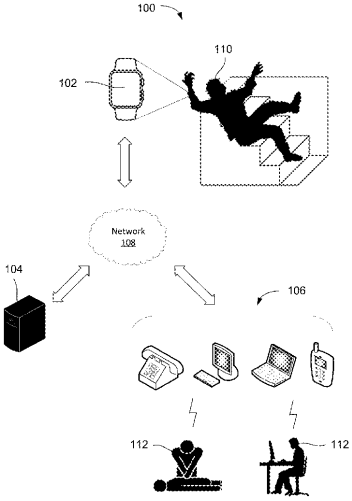 US patent application 20190103007 titled “Detecting Falls Using a Mobile Device” discloses a method of determining if a user has fallen due to an impact based on the user’s motion characteristics before and after the impact and accordingly sending alerts to a physician or caretaker for seeking assistance. Figure below illustrates the concept. US patent application 20190100108 titled “Robotic Vehicle Renewable Resource Charging Station Management Systems and Methods” discloses a charging station with a docking terminal having a charger, which is attached to a renewable energy harvesting device, to provide power to the robotic vehicle. Figure below illustrates an unmanned aerial vehicle (UAV) docked at the charging station. US patent application 20190102374 titled “Predicting Future Trending Topics” discloses techniques for processing social media posts based on region and vertical, and identifying future trending topics as a string of words. Illustration gives a glimpse of the predicted report. 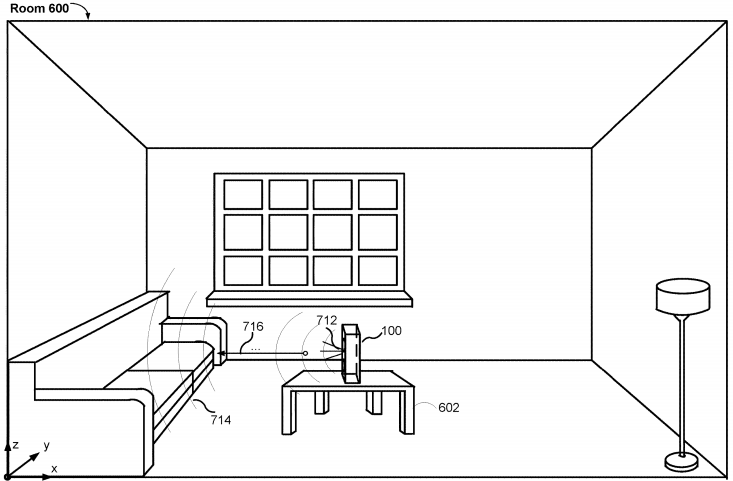 US patent application 20190103848 titled “Methods and Systems for Automatically Equalizing Audio Output based on Room Characteristics” discusses determining an acoustic transfer function based on audio content signals obtained from microphones, and adjusting speaker properties based on a frequency response obtained from the transfer function. Figures below illustrate the concept. US patent application 20190103103 titled “Voice User Interface Shortcuts for an Assistant Application” discloses an automated assistant that does not require individual commands but can use a shortcut command phrase to perform the actions, and control peripheral devices and applications. Figure below illustrates user establishing the shortcut command phrase with an automated assistant application. 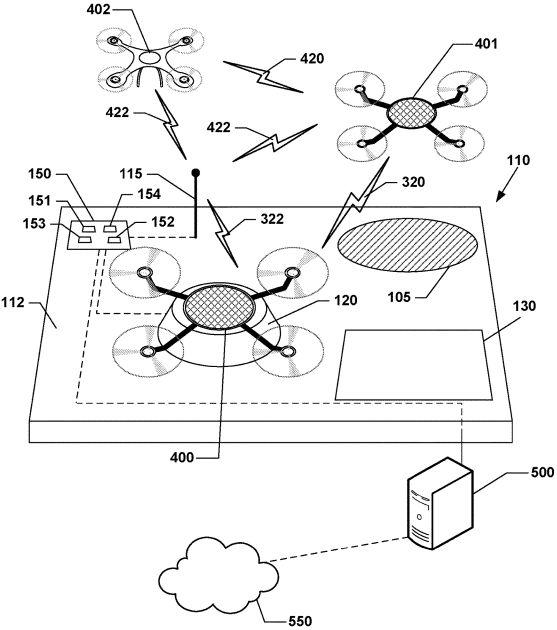 US patent application 20190104297 titled "Aerial Vehicle Sensor Positioning" describes a UAV with sensors mounted on winglets of the perimeter frame for generating a scene surrounding the aerial vehicle. 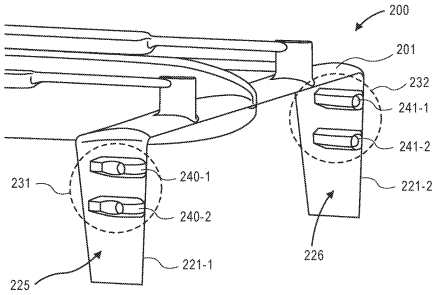 Figure below illustrates optical sensors mounted on front and rear winglets of an aerial vehicle. 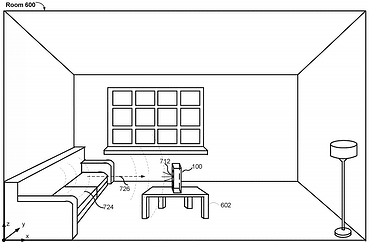 US patent application 20190099140 discloses a mobile system that acquires image data, and generates images. The system allows 360 degree movement for acquiring images relative to the position of the subject. Figure below illustrates the imaging system. 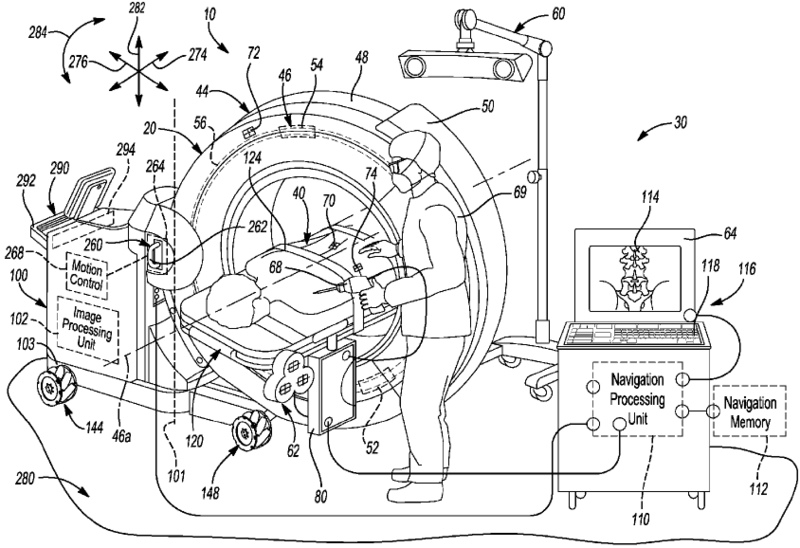 US patent application 20190099188 discusses a tissue compression device having straps for attaching the device to a tissue, and to apply pressure on the tissue to control over-bleeding while still allowing blood flow through radial artery. Figure below shows the tissue compression device. US patent application 20190099499 relates to cancer and autoimmune disorder treating polypeptides, antibodies, and antigen-binding fragments that comprise an engineered cysteine for site-specific conjugation. 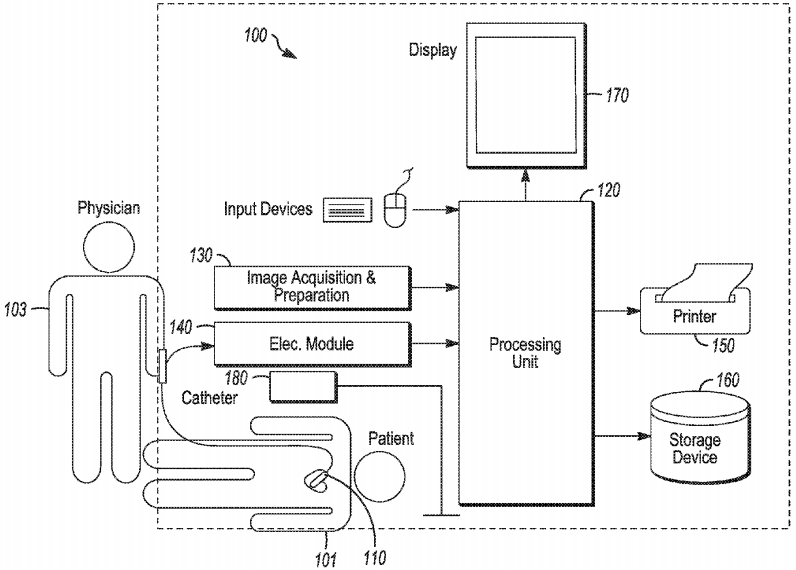 US patent application 20190099098 presents a system that has a display device to present a cardiac map and a processing unit for receiving electrical signals to generate the cardiac map and facilitate display of the map, where each electrical signal corresponds to a map location. The cardiac mapping system of the invention is illustrated in the figure below. 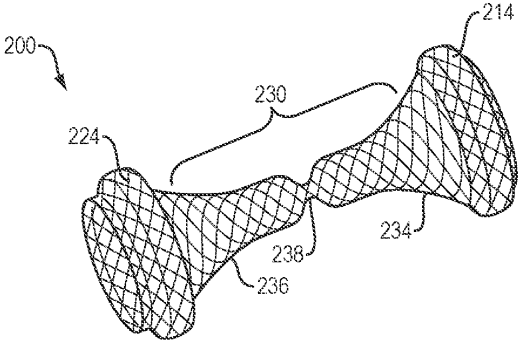 A flow control stent, as described in US patent application 20190099589 elucidates a medical device for establishing a controlled flow or access passage between body lumens. The figure below depicts the stent of the invention. US patent application 20190100752 describes an mRNA comprising a modified nucleoside selected from (I), (II), or (III), gene therapy vectors, and an open reading frame that encodes a protein of interest. The invention outlays the structure of the mRNA and aims to reduce the immunogenicity of mRNA molecules. US patent application 20190099292 relates to a vitrectomy apparatus having a disposable cutter with a linear voice coil motor to generate consistent and rapid guillotine action without the use of a rotary motor or traditional linear motor. Figure below depicts a cross-sectional view of the surgical device in an opened state. US patent application 20190100584 discloses amino acids sequences having immunoglobulin single variable domains (ISV) that will bind to IL-17A, IL-17F and IL-17A/F that can be used to treat autoimmune or inflammatory disorders.